On Sept 19, wiiw Scientific Director Robert Stehrer presented his Business Briefing 'EU strategies in the face of BREXIT' at a roundtable in Vienna. The Business Briefing summarises various policy options and their impact on the UK after 'Brexit'. Providing information on how deeply the UK and the remaining European Union (the ‘EU-27’) are integrated in various areas like trade and foreign direct investment and mobility of workers constituting the ‘four freedoms’ in the EU it shows that there is an asymmetry in the sense that the UK is relatively more dependent on the EU-27 than vice versa. Consequently, the EU-27 is less affected than the UK itself though there is some heterogeneity across countries and industries. Warranting free trade in goods between the UK and the EU-27 would reduce the negative impacts of Brexit, whereas restrictions in services might attract foreign direct investments. UK contributions to the EU budget are to be negotiated though might benefit both parties as allowing further cooperation in various areas. 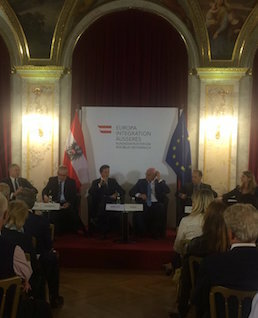 The roundtable - discussing the impact of Brexit on the UK and on the EU - was organised by the Federal Ministry for Europe, Integration and Foreign Affairs, together with 21st Austria, an initiative to foster an economic dialogue for Austria and the wider region. The other participants were: Martin Eichtinger, Austrian Ambassodor in the UK; Christian Kesberg, ‎Austrian Trade Commissioner for the UK; Claus J.Raidl, President of the Central Bank of Austria and spokesperson of 21st Austria; and Yvonne Toncic-Sorinj from the Austrian Ministry of Foreign Affairs. The discussion was moderated by Emb. Johann Brieger, Ministry of Foreign Affairs.